Dryhill is a disused quarry located on the south-western edge of Sevenoaks, just south of the A25 from which it may be reached via a narrow lane. 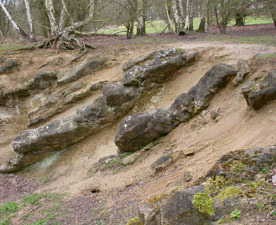 The quarry has been grassed over to create a public open space that has been designated by English nature as a geological Local Nature reserve (LNR). 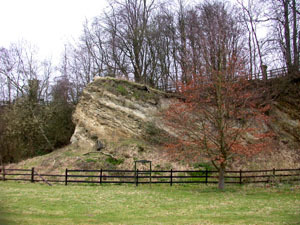 The site is well-known and provides a classic and nationally significant exposure through the "rag and hassock" facies of the Aptian stage (Lower Cretaceous) Hythe Beds. 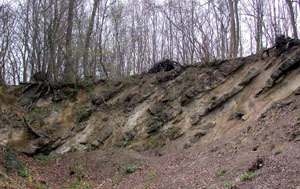 The facies exhibit characteristic sedimentological features including sediment silicification and the early development of chert nodules. As a quarry, the site was famous for its rich and diverse fossil brachiopod and bivalve fauna that was crucial for palaeontological studies and international correllation of the Aptian Stage. Fossils are not readily seen in the rock faces now exposed. Having free public access, the site is ideal for educational purposes. For this reason UK RIGS has commissioned educational material to be used by school parties and students.